Full color DuraSol inserts are durable and made to withstand every day wear and tear that comes with interchanging information in your signs on a regular basis. Customize these inserts with any text, logo, or design you send us, in any color scheme you require. Create the perfect inserts for your large interchangeable curved ceiling signs to help show direction in an airport, label aisles of a supermarket or departments in a super store, or to mark specific areas of your warehouse. If you have any questions, contact our customer service department via e-mail at service@officesigncompany.com or via phone at (701) 526-3835. Note: Our inserts are sold individually - please update QTY field accordingly. If ordering inserts for both sides of your sign you will need to order a quantity of two. Special Instructions - add any details or Email artwork@officesigncompany.com. Provide requested Pantone colors or color preferences. Once your order is submitted one of our artists will send your digital proof to the email address associated with your order, and production will not start until your proof is approved. 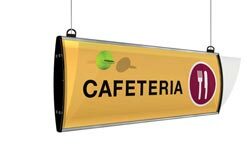 Popular curved hanging sign system, with removable clear non-glare lens. 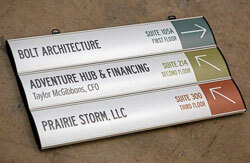 Two-sided suspended ceiling signs featuring a top-to-bottom curve in an anodized satin silver or black powder-coated aluminum frame and your choice of black or grey end caps. Large multi-panel double-sided aluminum ceiling signs with top-to-bottom curve are available in a satin silver or black frame finish with a choice of black or grey end caps. Each panel has a matte clear removable lens for easy interchangeability.